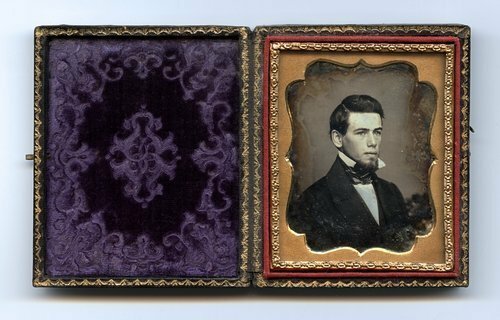 Cased ninth plate daguerreotype portrait of Edward Payson Fitch, a native of Massachusetts, who arrived in Kansas Territory in 1854 as a member of the third group of settlers sponsored by the New England Emigrant Aid Company. On August 21, 1863, he was killed in his house by one of William Quantrill's raiders during their infamous attack on Lawrence. The daguerreotype was made by Clark's Daguerreotype Rooms of No. 59 Court Street, Boston, Massachusetts. Creator: Clark's Daguerreotype Rooms, No. 59 Court Street, Boston.